The National Shooting Sports Foundation (NSSF) reports that the USD value of U.S. quarterly imports of all sporting arms and ammunition declined 19% in the second quarter compared to the same period in 2010. From April to June, imports were $273 million, down from $337.1 million as reported in the same quarter last year. However, the decline was mostly due to a huge 42% drop in ammo imports. Imported long-gun sales (in USD value) have actually risen substantially. Sales of imported rifles rose 26.3%, from $27.1 million to $34.2 million.The shotgun category increased 23.4%, from $38.3 million to $47.2 million. The muzzleloader category posted a 7% increase, from $6 million to $6.5 million. Bucking the trend, handgun imports declined 13.1%, from $109.5 million to $95.1 million. 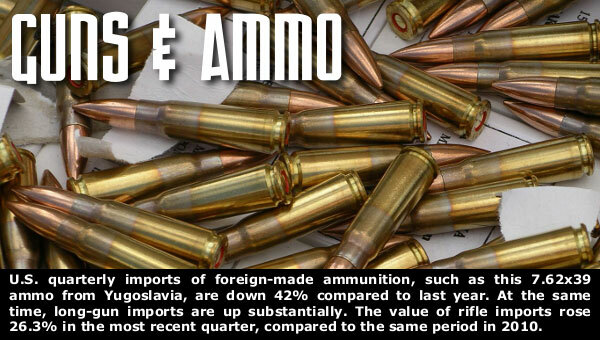 Over the past year, ammunition imports declined a whopping 42.2%, from $151.2 million (in Q2, 2010) to $87.4 million (in Q2, 2011). Moreover, the sales of imported shotgun shells fell 48.7%, from $5 million to $2.5 million. Apparently, now that there is a good supply of domestically-produced ammo, shooters are buying American again. Why has this occured? Currency fluctuations may be one reason. The declining value of the U.S. dollar, combined with rising shipping costs, have caused the price of imported ammo (and reloading components) to increase substantially in the past year. That has made domestic ammo more competitive price-wise. 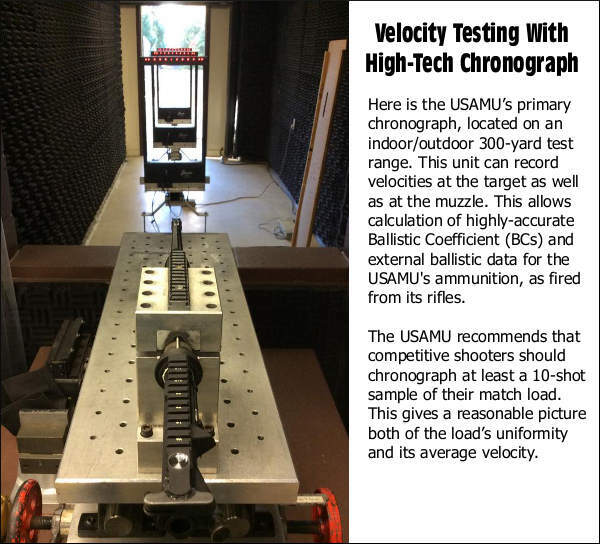 That is good news for U.S. ammo-makers. 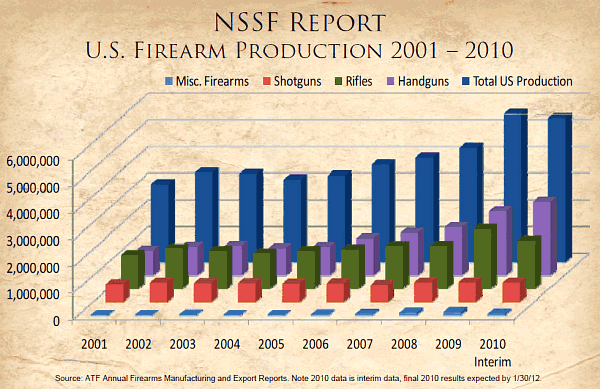 For additional research information and historical import data, visit nssf.org/research. Share the post "Shooters Buy Less Imported Ammo, But More Imported Guns"
Americans are apparently buying more pistols but fewer rifles — that’s the trend suggested by the latest Firearms production statistics from the Bureau of Alcohol, Tobacco, Firearms and Explosives (ATF). According to the ATF’s 2010 Interim Annual Firearm Manufacturing and Export Report, U.S. firearm manufacturers produced more than 5.4 million firearms in 2010. This represented a small (2.7%) reduction in total U.S. firearm production compared to 2009. However, the really notable statistic was a dramatic 18.8% reduction in rifle production. Rifle production decreased 18.8%, while handgun production increased 14.9%. That’s a big swing. Shotgun production remained relatively steady, only dropping 1.2 percent. Editor’s Comment: Since these are production numbers, not sales figures, it may be premature to say that American shooters are spending a lot less money on rifles, but we know that sales of AR-type “black rifles” are down significantly. There was a rush of AR “panic buying” after the last presidential election that was not sustained. We are also concerned that fewer young Americans are learning to shoot rifles, while the average age of target rifle shooters continues to climb. We need to expand efforts to get young people involved in rifle shooting and hunting. Share the post "ATF Reports Rifle Production Down, Handgun Production Up"
According to the latest Firearm Manufacturing and Export Report from the Bureau of Alcohol, Tobacco, Firearms, and Explosives (ATF), U.S. firearm manufacturers produced more than 5.4 million firearms in 2009. That’s a big increase compared to the start of the decade in 2001, when less than 3,000,000 firearms were manufactured by U.S. companies. 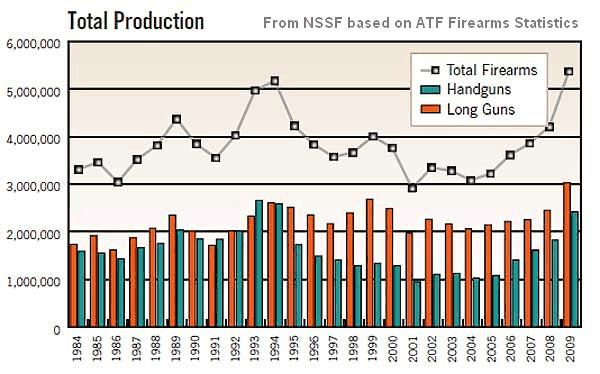 In recent years, production of both handguns and long guns has grown significantly, as show in the graph below, prepared by the National Shooting Sports Foundation (NSSF) based on ATF records from 1984-2009. Total firearms produced in 2009 topped 5.4 million, exceeding the previous high total in 1994. Over 3,000,000 long guns were produced in 2009, the highest quantity in the past 25 years. The total number of firearms sold in 2009 works out to one gun for every 57 citizens, based on the 2009 U.S. population of 305,529,237. After a decade-long decline, handgun production rose dramatically from 2004-2009. If trends continue, in a few more years, pistol sales could out-number long gun sales. NSSF research has updated its 14-page Industry Intelligence Report, titled Firearms Production in the United States, with the most recent data on U.S. production of pistols, revolvers, rifles and shotguns. Additional updated data found in this report include: Annual Survey of Manufacturers figures and U.S. International Trade Commission firearm import and export figures. The report is available for free to NSSF members by logging into the members section of the NSSF website, clicking “NSSF Industry Research” and then clicking “Industry Intelligence Reports.” For more information, log on to www.nssf.org. Share the post "U.S. Gun Production Rises to 5.4 Million Firearms in 2009"
The National Sporting Goods Association (NSGA) has issued an interesting report charting gun sales by region. Southerners like handguns, and those in the Great Lakes states purchase the most shotguns by far. In 2008, southern Atlantic states led per capita in handgun purchases and also accounted for 31.4 % of all handguns bought in the United States. East north central states led per capita in shotgun purchases and accounted for 33.4 % of shotguns sold. The Mountain states led per capita in rifle purchases and accounted for 10.7 percent of rifles sold. But the South Atlantic states’ residents buy the most rifles overall — 22% of the nationwide total. It is interesting that the Pacific states (California, Oregon, Washington) encompass 14.7% of the U.S. population, but that region accounts for only 10% of rifles and shotguns sold. On the other hand, Pacific states’ residents buy 14.2% of all handguns, the second highest figure among regions. Maybe all those crazy gun control laws in California haven’t made things any safer, and people feel the need to arm themselves. Share the post "Firearm Sales Charted by Region — Southeastern and Mountain States Lead Rifle Purchases"